Today we’re highlighting Georgia Virtual School, a user of SoftChalk, by featuring an informal interview with Jay Heap, the Director of Operations at Georgia Virtual School. Read on to learn about their program, why it’s successful and why SoftChalk is a great virtual learning software program. Describe the Georgia Virtual School program. Georgia Virtual School (GAVS) is a program of the Georgia Department of Education's Office of Technology Services. The program is SACS CASI accredited and operates in partnership with schools and parents to offer middle school and high school level courses across the state. 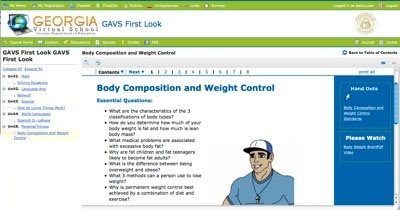 GAVS provides a teacher led, virtual classroom environment. GAVS also equips students with an online media center and guidance center to support students throughout their online course experience. What made the DOE decide to implement a virtual school in Georgia and what year did it start? The Georgia Virtual School started in 2005 under the direction of then Governor Sonny Perdue to provide equitable access to AP courses for students throughout the state, particularly in rural Georgia. How many classes/courses do you offer at GAVS and how many students are currently enrolled? Approximately 5,500 students are enrolled in over 120 course offerings. The courses are in the core content areas, world languages, CTAE, electives, and a 23 AP course selections. Who develops the course content for your classes? All GAVS courses are created or revised using experienced development specialists employed by the school. Generally, subject matter experts are contracted to work with the development specialists to create the learning material. I know you are using SoftChalk to development much of your course content, what features have the course developers found most valuable? Our development specialists like the ease of use and the built in navigation controls. Our content developers like the inclusion of the Inline activities as a way for students to assess their learning within the SoftChalk package and provide feedback during the learning process. The ability to integrate SoftChalk lessons into our learning management system, Desire2Learn, is also an added benefit. I noticed you offer mobile learning options to your students. Is this a popular option among students? How do the majority of the students access their course content? We have just made mobile learning available to students. GAVS provides anytime, any place access. With the increased use in smartphones and tablets, we expect both students and teachers to make use of the mobile technology. I’m curious what your online interface looks like. Do you have a sample course? Yes, we provide access to a demo course on our website. The demo course is fully interactive so students and parents get to see exactly how the courses work. Some of Georgia Virtual School’s learning materials are available to everyone on the Georgia Virtual Learning site. We have included modules in many course classes and will be adding more over the next several months. These resources can be found at http://ww.gavirtuallearning.org/resources. What type of feedback do you normally get from students about the courses? Generally, the feedback from students and parents is positive. Our completion rates and test scores reflect a high level of student success. Students enjoy the flexibility of the online environment and the consistency of the course material. Thank you so much for your time Jay, in closing are there any fun facts about the program you’d like to share? The Georgia Virtual School has seen increased growth over the last few years and all of the administration and teachers work hard to provide options and opportunities for students. The new Georgia Virtual Learning site was launched on February 14th, 2011 and includes a growing list of free educational resources for students and parents. Starting in July of 2011, GAVS /GAVL committed to creating all new course material from open educational resources (OER). The 2011 ACTFL (Foreign Language) Teacher of the year, Clarissa Adams Fletcher, teaches part time for the Georgia Virtual School. In Fall 2012, GAVS will offer new AP courses including AP Calculus BC, AP Physics: Mechanics, and AP Physics: Electrical. Learn more and stay connected with Georgia Virtual School by following GAVS on Twitter and liking GAVS on Facebook.